Standing up in difficult situations is hard. But, no one said transformation leadership was going to be easy. It takes a special leader to fight the status quo. Standing up is hard, but it’s a leader’s job. For most of us, standing up is a metaphor for challenging the traditional, the things we don’t understand, and the things that don’t feel right. Ironically, inquisitive leadership is not as strong, or pervasive, as it once was. Leadership guru, John Maxwell, agrees. 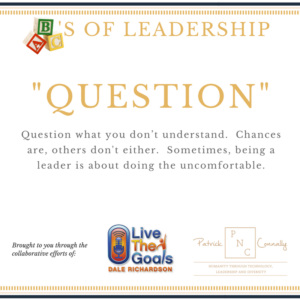 His 2014 article ‘Why Leaders Lose Their Curiosity’ cites insecurity, low self-esteem, arrogance, contentment, and distraction as the leadership leeches stifling this key leadership characteristic. Losing curiosity means less growth – accepting things at face value, not looking for ways to engage new team members, not challenging archaic policies and thinking. This may be THE quickest way to kill your organization! Besides, what better way to promote leadership than by teaching your team the value of learning to accept, and challenge existing, or contrary views. Warren Berger’s 2015 Harvard Business Review article, ‘Why Curious People Are Destined for the C-Suite’ believes that, in the current climate, “success may be less about having all the answers and more about wondering and questioning.” Practicing this style of leadership drives acceptance of diverse ideas, and helps refine ideas and suggestions. This increases innovation, and also strengthens an organization’s culture. Asking questions sounds simple, but it has it’s own challenges. Berger noted that most leaders are focused on solving problem. This means leaders are forced to be deliberate in their focus on changing how they approach problems and situations. Push yourself to the next level of leadership. Hesitate, write your thoughts down, and engage others by soliciting their feedback of ideas, concepts and challenges. Set a goal to ask three (3) questions before offering a solution. Challenge yourself to question more!